Review by AllTheBestFights.com: 2015-07-18, disappointing fight between Michael Bisping and Thales Leites: it gets two stars. The TUF 3 light-Hw tournament winner Michael Bisping entered this fight with a professional mma record of 26-7-0 (73% finishing rate) and he is ranked as the No.11 middleweight in the world. He suffered his last loss at the end of 2014, against Luke Rockhold (=Rockhold vs Bisping), but he came back to win in 2015 beating CB Dollaway (=Bisping vs Dollaway). His opponent, the black belt in Brazilian jiu-jitsu Thales Leites, has an official record of 25-4-0 (72% finishing rate) and he entered as the No.9 in the same weight class (currently the #1 in this division is Chris Weidman). His last defeat occurred in 2010 when he faced Matt Horwich, since then he has won eight consecutive bouts taking revenge on Horwich in 2012 (=Leites vs Horwich 2) and defeating Tim Boetsch in his last fight (=Boetsch vs Leites). 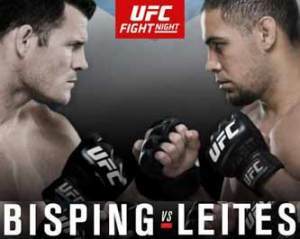 Bisping vs Leites is the main event of the UFC Fight Night 72 – UFC Glasgow. Watch the video and rate this fight!